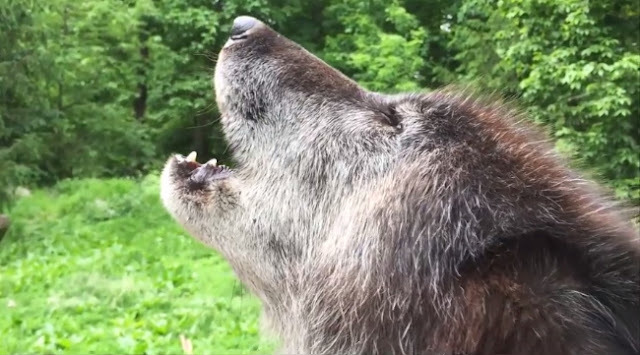 Canadian/Rocky Mountain Gray Wolf Howls the High Notes! Zephyr (meaning "light or west wind") is a beautiful black male with a prominent nose and a feisty personality. He and his litter-mate, Alawa (meaning "sweetpea" in Algonquin, and pronounced "ai-lay-ewa"), were born on April 20 and arrived at the WCC on May 27. They join Atka to make up the Ambassador Pack - the wolves on view as part of the WCC's education programs. Zephyr is a natural crowd pleaser, happy to howl with the slightest prompting. His engaging personality resembles that of Apache, the leader of the WCC’s first ambassador pack who passed away in March of 2010. Zephyr has big tracks to fill and we have no doubt that this little pup will earn an impressive number of fans on his very own! Their lineage is a mix of gray wolf subspecies, but they are primarily Canis lupus occidentalis - Canadian/Rocky Mountain gray wolf -- a subspecies that traditionally inhabited parts of the western United States, much of western Canada, and all of Alaska. Responses to "Listen the bone-chilling sound of a wolf howling "
Love the sound of wolves howling.